Pull down, single pole spray faucet, finished in Onyx. Faucet features solid brass construction, easy to change out ceramic disc cartridge, backflow prevention, and dual spray/stream flow. Spray head extends to 24. Certified by cUPC<sup></sup>. Lifetime mechanical warranty, and 2 year warranty on decorative finish. Spray head extends to 24"
Double bowl granite top mount sink. Includes integrated accessory ledge on sink rim, one stainless steel bottom grid to protect sink bowl, and waste fittings. Kindred Granite sinks feature smooth Durakleen finish to ensure ease of cleaning, and a patented Sanitized Silver<sup></sup> compound for added hygiene even between cleanings. Pump activated dispenser for soap or lotion, right at the sink ledge!. Features solid brass construction, 500 ml top filled polypropelene bottle, Teflon lined spout to prevent clogs, lifetime mechanical warranty, and 2 year decorative finish warranty. Dispenser can accommodate a countertop thickness up to 1.5. 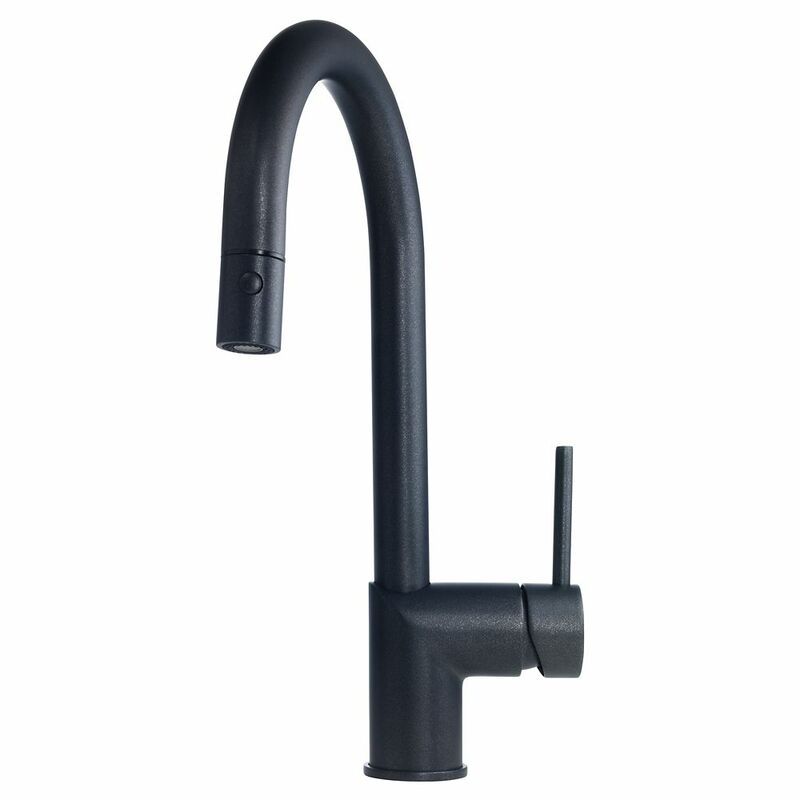 Gooseneck pull down faucet Onyx Pull down, single pole spray faucet, finished in Onyx. Faucet features solid brass construction, easy to change out ceramic disc cartridge, backflow prevention, and dual spray/stream flow. Spray head extends to 24. Certified by cUPC<sup></sup>. Lifetime mechanical warranty, and 2 year warranty on decorative finish.